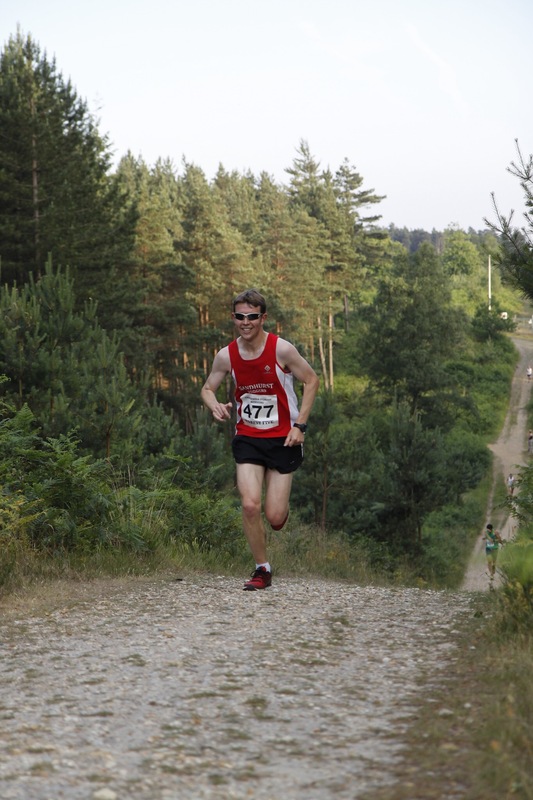 On the hottest day of the summer (and likely of recent summers) six members tackled a stiflingly oppressive course around Swinley Forest for BFR’s Forest Five race. Graham Robinson won overall finishing in 28:51, twenty four seconds clear of the rest of the field. Andrew Brooks was next SJ to finish in an impressive 17th overall and 5th V40. Helen Vizard took 3rd in the V45 category with Trish Monks 8th V35. The two Patricks; Wadsworth and Denston also finished strongly. Also, in the excitement of all last weekend’s races I didn’t include the results from the June Handicap. Numbers were down due to a clash with the Woodland 5 and plenty of tired legs after Endure24 but some impressive runs nonetheless especially from Martin Steadman and Jim Laidlaw who both improved on their previous bests. So halfway through the year the Handicap competition looks like this. Jim Laidlaw has a sizeable lead but it is very tight in the battle for the podium. Also with your best seven results to count there are still six more chances to score points and improve your position. Big day at Bracknell Parkrun as the latest graduates of the Pure Beginners programme completed their first 5km event. Big congratulations to Samantha Pittick, Jonathan Evershed, Jo Harrison, Lauraine Briggs, Catherine Lacey, Lorraine Davies, Fiona O’Kane, Grace Stockle, Michelle Williams, Dawn Rudman and Jane Meakin. Also at Bracknell, Dave Breslin ran his fastest time this year with 22:27 to lead the SJs home while Paul Biggs and Blanche Barnes each bagged another course PB with 25:13 and 32:52 respectively. Over at Frimley Lodge Mark Pattrick was first member to finish in 21:07 closely followed by Dave O’Toole. At Rushmoor Nigel Evans was home first of the SJs in 25:10 with Stuart Mayes not far behind as other members sampled the Rushmoor course for the first time. Kate Parker recorded her fastest ever Parkrun with 27:09 with Alice Copeland and Sarah Johnson for company in their first runs at the venue. Some new Parkrun tourism this week. Lisa Hale ran at Banstead Woods in South-East London, Lee Wells was in action at Bedfont Lakes near Heathrow, John King re-ignited his love of running at the home of Parkrun; Bushy Park and John Tovell ran on his home course Crane Park. Sensational run from Patrick Denston at the Swansea Half Marathon as he knocked thirty two minutes off his Half earlier this year and beat his PB to finish in 1:48:27. John King raced well at the Polesdon Lacey 10k doubling up this weekend having fallen in love with running again at Bushy Park Parkrun. 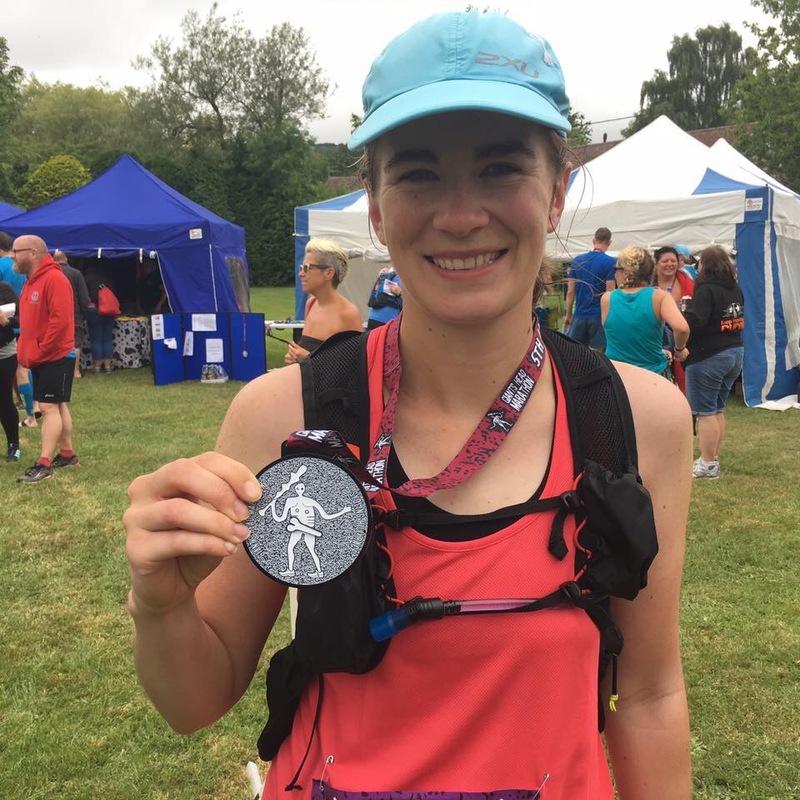 Andrea Hadfield enjoyed a great run at the Giants Head Marathon at Sydling St Nicholas near completing the challenging course and her tenth marathon in 5:38:05. Great time on the hilly course which featured nearly 1000m of climbing. Interesting medal and T Shirt design… not sure where that will be appropriate to wear? Tuesday: There will be multiple groups running on Tuesday from Sandhurst Memorial Park this week starting at 6:30pm. Later the interval sessions will be an ‘Away’ run meeting at Hawley Lake Sailing Club at 8pm for a pairs session.